Choose fish that interact with you and the other fish. In order to have a successful Koi business or beautiful water garden you need to be very cautious when choosing your Koi. It is best to buy your Koi from a reputable pond or water garden dealer. If you choose to pick your fish up at the local pet supply you will need to make sure, they have a return policy in case of illness or death. It is better to buy your Koi from a local dealer because the Koi will have not traveled very far thus reducing the stress of transport, which will increase your chances of having Koi that make a healthy transition from the breeder to your home. Other problems your fish might have if you purchase from a chain store are diseases or bacteria, which might weaken your Koi’s immune system. Finally, the Koi from chain stores are not always fed an appropriate diet for growth or health. 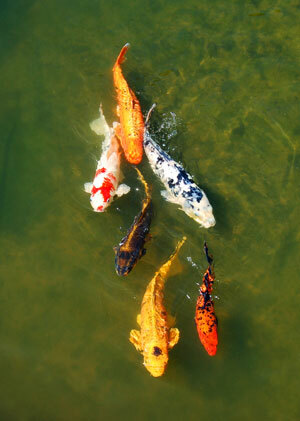 There are many types of Koi from which you can choose. Most Koi will be sold by color. There are also Koi with patterns, scales, and un-scaled fish. If you are considering breeding or showing your fish be very cautious that you choose a fish that actually have the characteristics of the breed. For instance, Butterfly Koi are beautiful, but they do not breed well. Many breeders do not live up to the quality of characteristics one would want on a fish they would use to breed or show. You will also find that if you do not invest in your Koi you will most likely have a lower quality fish, which is perfect for a garden, but wouldn’t work for a breeder. Always check that your fish look robust and healthy. Other things to look for in your Koi, are they swimming about and social with the other fish. Are the Koi curious about the human visitors? Some Koi can be timid, so you will want to choose fish that are near the surface of the water, and interact with you and the other fish. Of course, there is no reason you cannot choose a fish that is a bit shy, and work with him or her in their new pond so they become more social. Finally, watch as the fish swims if it appears to stop and start, or juts around it may have a problem with its swim bladder. Next, check the quality of the fish by checking its respiratory organs. Koi can have gill flukes meaning they have redness around their gills and possibly only have one gill. If you notice, any problems with the respiratory area do not purchase the fish. You consider not purchasing from that particular breeder at all, as all the fish may have this issue when they breed. Now examine the body of the fish. The Koi should have a thick and well-defined middle that tappers towards the tail. The skin should be injury free and have no problems with the scales. Do ask when the Koi you are observing were last transported because you may see minor injuries from transport, which should not stop you from purchasing that particular Koi. The main thing to avoid in your Koi is any redness especially around the respiratory organs. Pay attention to the color of the fish. Koi can change colors as they grown. If you choose a baby with dark orange and black coloring your may find as they grow they become orange and red. One way to avoid this problem is to purchase adult Koi. You can also avoid this problem by purchasing from a breeder that only breeds they color of Koi you are interested in purchasing. The cost of your Koi will be influenced by their color, so be prepared to pay for quality adult fish. Finally, pay attention to the proportion of your Koi. It should be in proportion in length and width. The stomach shouldn’t be overly extended. The stomach tapers between the pectoral and dorsal fins. The back of the fish should be smooth, and the face should be well defined. You may find a particular Koi catches your eye or is very social with you. Don’t let imperfections stop you from purchasing this Koi. If you intend on breeding choose the best quality fish you can find, but if these are just your garden pets a few flaws won’t matter to your or the other fish. It is most important that you choose a healthy fish over an aesthetically pleasing looking fish.